The National Sundae Day is celebrated on November 11 which is quite ironic as the sundae is an ice cream dessert. Perhaps, this food-related holiday is intended to remind us of summer. The sundae typically consists of several scoops of ice cream topped with syrup or sweet sauce. Other toppings can also be used such as whipped cream, sprinkles, fresh or canned fruit, maraschino cherries. The true origin of this dessert and its name is unknown although the word “sundae” is believed to derive from the word “Sunday”. There are several cities in the U.S. that claim to be the birthplace of the original ice cream sundae, including Two Rivers, Wisconsin; Evanston, Illinois; Ithaca, New York; Plainfield, Illinois. The classic ice cream sundae is made of vanilla ice cream topped with a flavored syrup or sauce, whipped cream, and a maraschino cherry. 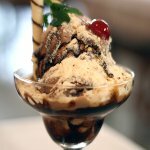 Other types of sundaes include fresh fruit sundaes, heated-sauce sundaes, hot fudge sundae, double fudge sundae, caramel sundae, butterscotch sundae, and many others. To celebrate the National Sundae Day, indulge yourself with your favorite type of this delicious dessert. You can make it yourself or pick one at a local ice cream shop or coffee shop.